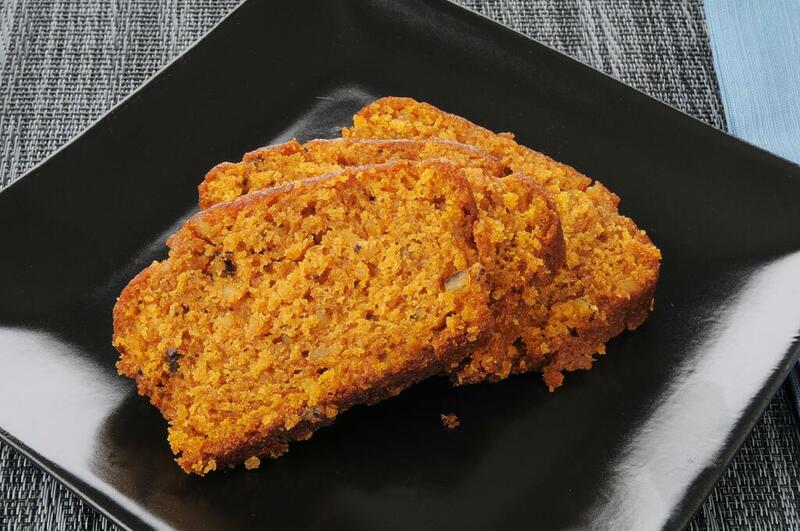 Here's an excellent olive oil pumpkin bread recipe. Make a batch ahead of time. You can freeze it for up to three months. Preheat the oven to 350 degrees. Use 2 teaspoons of the oil to grease the inside of a 9-by-5-inch loaf pan. Whisk together the flours, baking soda, baking powder, cinnamon, nutmeg, ginger and salt in a mixing bowl. Beat the pumpkin, honey, brown sugar, the remaining 1/3 cup of the oil and the eggs in a separate bowl until well combined. Add the dry ingredients to the wet and stir just until evenly incorporated. Pour the batter into the pan, smoothing it into the corners evenly. Sprinkle the top with pumpkin seeds, pressing them down lightly. Bake for 45 to 50 minutes, until the top is browned and a wooden skewer inserted into center comes out clean. Cool in the pan for 15 minutes, then transfer the pumpkin bread to a wire rack to cool completely before serving or storing.